PDF Download - Angels are the guardians of the home and hearth. 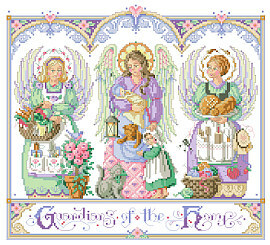 Three heavenly beings are here to protect your garden vegetables and flowers, light the way for your children and pets, and keep a watchful eye on the kitchen and it’s domestic duties. Just like mothers, an angels’ work is never done. Each PDF download comes with a full color image, chart, DMC floss color guide, general instructions, and stitch guide.